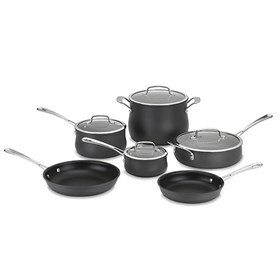 The Cuisinart 64-13 is a stylish 13 piece set of cookware to decorate the kitchen. The cookware features hard anodized aluminum core construction for fast and even heating. The set has reinforced nonstick cooking surface for lasting food release, healthy cooking and easy cleanup. The tempered glass lids seals in flavor while keeping the contents visible and a specially designed rim allows for easy drip-free pouring. The 13 Pc Contour Hard Anodized Cookware Set has many exciting features for users of all types. The 13 Pc Contour Hard Anodized Cookware Set is sold as a Brand New Unopened Item.